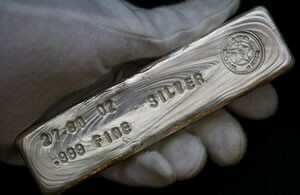 Precious metals declined Thursday. Gold fell less than 0.1% while silver dropped 1.6%. Gold futures held fairly steady Thursday, dipping for a very modest loss as some investors booked profits. Silver was hit harder. Both metals remain higher on the week so far. Gold for April delivery, now the most active contract, shed 20 cents to settle at $1,116.10 an ounce on the Comex division of the New York Mercantile Exchange. Gold prices ranged from a low of $1,110.20 to a high of $1,126.40. "Given the rally of the last few days I would have thought gold would be down a lot more today than it is," MarketWatch quoted Colin Cieszynski, chief market strategist at CMC Markets. "I think we’re seeing a switch in gold this week from trading inversely to the stock market back to trading inversely to the U.S. dollar." Gold futures slipped 0.4% on Wednesday but on Tuesday they jumped 2.2% and marked their best settlement since Nov. 2. They are 1.8% higher on the week and are up 5.3% on the year. Silver for March delivery lost 22.7 cents, or 1.6%, to settle at $14.232 an ounce. Silver prices traded from $14.07 to $14.54. They lost 0.7% in the previous session after rallying 2.2% on Tuesday to close at their highest level since Nov. 6. The precious metal is up on the week by 1.2% and higher on the year by 3.1%. April platinum fell $14.20, or 1.6%, to $867.90 an ounce, ranging from $863.10 to $886.90. Platinum rose 0.6% on Wednesday. Palladium for March delivery fell $10.25, or 2%, to $492 an ounce, trading between $490.05 and $505.60. Palladium rose 1.9% on Wednesday. Gold shed $2.25, or 0.2%, to $1,114 an ounce. Silver dropped 80 cents, or 5.6%, to $13.58 an ounce. United States Mint bullion sales were unchanged as of 3:25 PM ET. The agency’s flagship bullion American Silver Eagle has already scored a January total that is the highest for a month since January 2013.